Nanny Poppinz is A 27/43 Company. 27 Years Old and 43,000 Happy Families. If you are interested in a successful career as a Nanny in Orange County, then Nanny Poppinz is the destination for you. 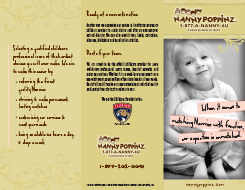 Nanny Poppinz is the leading Nanny agency in the Orange County area. At Nanny Poppinz, we can help you, as a childcare professional, grow and get placements in suitable families as a Nanny in the Orange County area. If high professional standards and making a positive difference to a family needing childcare matter to you, then sign up with Nanny Poppinz today. Nanny Poppinz frequently has open jobs of a temporary nature which are shorter in duration than permanent jobs. These jobs often come up on short notice and can be in a family's home or at a hotel/resort in the Orange County area. Your fee is due in cash at the end of the evening and in the event Valet parking is required than the client often covers the expense. You will have to be a completely qualified Nanny Poppinz Nanny to take these jobs. If you are not currently a Nanny Poppinz Nanny and you are interested in becoming one, please click the "Nannies Click Here" button which is just to your left on the page. Additional Requirements:: Reason: Child Care Unavailable Pets: None Parking: Yes Public Transportation: No Driving Required: No Vehicle Provided: No Family's Comments: Parking is a bit tight right by our house. Go a bit further up the street and there's an area on the downhill side (right side) you can park at. Additional Requirements:: Reason: Child Care Unavailable Pets: Dog Parking: Yes Public Transportation: No Driving Required: No Vehicle Provided: No Family's Comments: 2 small dogs under 20 lbs. Pet Description: 2 small dogs under 20 lbs. Additional Requirements:: flexibility. The children are older, so they don't need as much childcare as a toddler. What they do need is someone who will kindly enforce the house rules and help them develop their own sense of responsibility, teach them kindness and love, and also have a strong sense of where the line is. Our oldest is a challenge and after she gets to know you, will truly try to push you over the edge. She has been in therapy over the last two years to address her anger issues and her behavior. She is much better than she used to be, but it is good to be aware of her tendencies so when something pops up it can be dealt with. The kids will need help after school with a snack, home work and being driven to their activities (usually 1x/week per child). Dinner will need to be provided for the children as well, and possibly Galen (extra so he can eat it when he gets home). I do not work 5 days a week. There are many times that I will only be at work 2-3 times per week, which means that we will only need the morning hours on the days that I will be coming home. Pet Description: Biggie. 8 y/o lab. Very easy going, love being pet. Dixie. 3 y/o boxer. Needs daily exercise and attention, very sweet. Responsible for Pets: Would be great if the nanny could feed/walk dogs when parents are not home. Who is responsible for the pets: Would be great if the nanny could feed/walk dogs when parents are not home. Living Area: the only bedroom downstairs. TV in room. Fully furnished bedroom.. 2 large windows that face the front of the house. Large closet. Additional Duties: Both Galen and I work civil service. I work for SFFD and Galen will be starting the alameda county sheriff academy in July. I am often gone for 24-48 hours at a time, Galen will be gone M-F from 7am-8pm for the first 6 mo, then will go to shift work there after. We will only need care 2-4 days per week, dependant upon my work schedule which rotates weekly. I have my schedule 1 year in advance so i am able to provide scheduling months in advance if needed. I am the childrens step-mother and the kids are with their birth mother on weekends and spring break. Galen will be home with the kids over most holidays, as he will have them off for 2019. If by chance we do need childcare on a holiday we will provide holiday pay. In addition, because our schedule is not common and our nanny will enjoy many "free" days during the week and every weekend, we will not be providing vacation days. Additional Requirements:: New to nanny care; looking into hiring part time nanny for 6 month old boy in Lake Forest. Pet Description: Boston is a 5 year old austrialian shepherd who is extremely loving and smart, but just like any dog he barks at the door, other than that he is a very good dog. Pet Description: Dog is an Australian cattle dog, rescue. is anxious around strangers until he becomes comfortable with them, he has basic training. Super sweet, loves to give kisses snuggle and eat all food. Cat is an Orange Taby, loves attention, usually stays upstairs lounging in the sun because cody chases him whenever he comes down stairs. Also has 2 tortoises: they live in an outdoor pen and are fed daily whenever they are not hibernating. OtherNeeds He's a busy guy and likes to run. Like run and hide and not tell you where he is. You need to be with him 100 percent of the time and one step ahead of him. He's very smart, funny, strong willed and needs to have choices. He needs someone that is kind, fun, energetic, and yet firm. OtherNeeds Great guy! Kinda shy. Super Smart and very funny. Cleaning Duties Details: Help and motivate boys to clean up toys. Keep kitchen clean, sink clear, put dishes in dish washer etc. Additional Duties: Possible grocery shopping for our family and meals for boys. Would like someone once a week on Tuesdays (hours could be longer on Tuesdays) and a possible week or weekend night. Then an occasional weekend long once every other month or few months. Also, possible travel on occasion to other states, ocean cruises, or other countries with our family. OtherNeeds Mild autism, he is verbal and social but has anxiety. Eats and functions normally. Additional Requirements:: Swimming not a requirement but there is a pool at the hotel. Pet Description: Two friendly cats. Pet Description: My husband (Gautam) will be working from home if you need anything. He can keep the dogs in the bedroom or in the yard if there are any issues. OtherNeeds May require extra care. Pet Description: Two cats. Male neutered. Brothers. Domestic short hair. 5 years old. They go outdoors. Friendly and laid back. Responsible for Pets: The nanny doesn’t need to do anything for the cats except call them in if they go out. Who is responsible for the pets: The nanny doesn’t need to do anything for the cats except call them in if they go out. OtherNeeds Looking for someone who can also take him places like the lion safari, the zoo, a park or a movie. Additional Duties: Hours above are just childcare can start at 3pm if can tutor. Additional time will be for errands, laundry, cooking and prep for cooking, putting packages away, need house clean. Willing to stay overnight. Cleaning Duties Details: Cleaning kitchen. Mopping and vacuuming floors once a week. Cleaning Duties Details: Kids laundry and bedroom tidy and keeping common such as kitchen and living room areas tidy.